Skeptic: Viewing the World with a Rational Eye. Hosted by Philip Maldari. 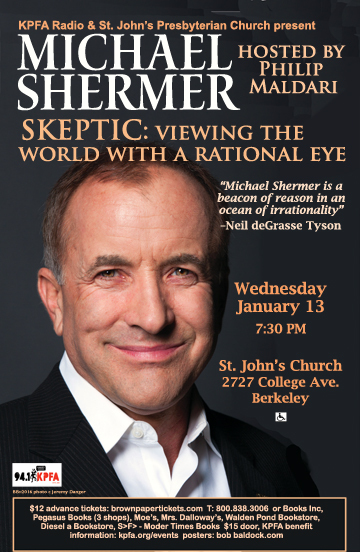 For fifteen years, Michael Shermer has written a column for Scientific American magazine that synthesizes scientific concepts and theory for a general audience. His trademark combination of deep scientific understanding and an entertaining writing style has thrilled his huge and devoted audience for years. Now, in SKEPTIC: Viewing the World with a Rational Eye, seventy-five of these columns are available together for the first time. His many previous books include: The Moral Arc: How Science and Reason Lead Humanity Toward Truth, Justice and Freedom, and The Believing Brain: From Ghosts and Gods to Conspiracies and Politics—How We Construct Beliefs and Reinforce Them as Truths. Michael Shermer is the author of The Moral Arc, Why People Believe Weird Things, The Believing Brain, and eight other books on the evolution of human beliefs and behavior. He is the founding publisher of Skeptic magazine, the editor of Skeptic.com, a monthly columnist for Scientific American, and a Presidential Fellow at Chapman University. As a public intellectual he regularly contributes editorials, book reviews and essays to the Wall Street Journal, the Los Angeles Times, Science, Nature, and other publications. He has appeared on the Colbert Report, 20/20, Dateline, Charlie Rose and numerous other shows, as well as in countless science and history documentaries aired on PBS, A&E, Discovery, the History Channel, and the Science Channel. Dr. Shermer was the cohost and coproducer of the 13-hour television series, Exploring the Unknown.